Vinnicius Martins from Brazil has taken out the 19th Annual Key West Classic in Florida today, conquering the grueling 12 mile course to defeat Kelly Margetts and Larry Cain. The JP Australia team rider rebounded from a disappointing finish at Carolina last week to triumph today, crossing the line about 30 metres ahead of Kelly (Lahui Kai/Quickblade), who finished top five at Carolina and who was our pre-race Key West favourite, while Larry (Starboard/Quickblade), who was the two-time defending champion at this event, wasn’t far behind in third. While the top three was an all-international affair, Florida boys Kieran Grant (Hovie), Garrett Fletcher (YOLO) and Connor Bonham (BIC) took the next three spots for the home team. In the women’s 12 miler, Wrightsville Beach local April Zilg (Hobie) backed up her strong performance last weekend with victory in today’s elite women’s race, edging out local favourite Seychelle Hattingh (Mistal) while another Carolina top 10 finisher, Kim Barnes (Riviera), rounded out the podium. 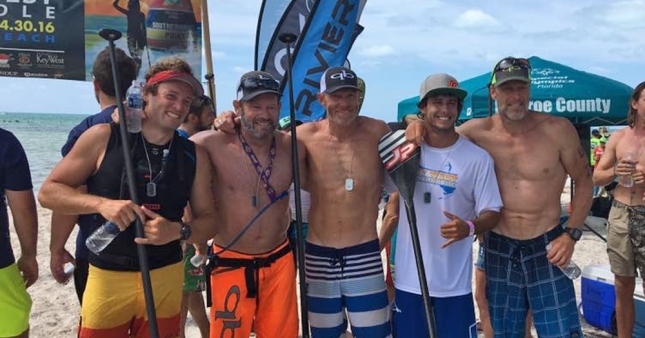 The Key West Classic, now almost two decades old, has grown from a small kayak and paddleboard race into Florida’s premiere stand up paddle race, attracting hundreds of paddlers from across the state, the country and, this year, around the world. The race has only just wrapped up, so check back tomorrow for a full recap, photos and video. In the meantime head on over to the official Facebook page for a stream of race day pics.